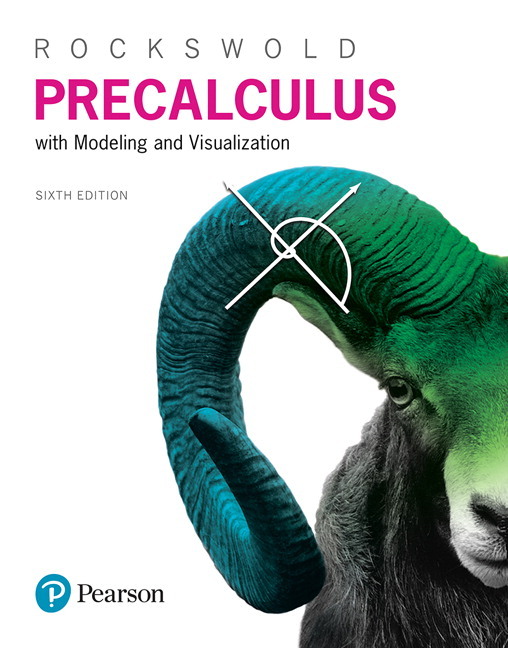 For courses in College Precalculus Mathematics. This package includes MyLab Math. Gary Rockswold doesn’t just mention real-world examples; he teaches mathematical concepts through those applications. For example, if we look at Facebook usage over time, what might that tell us about linear growth and predictions? In this way, students learn the concepts in the context of the world they know, which leads to better understanding and retention. 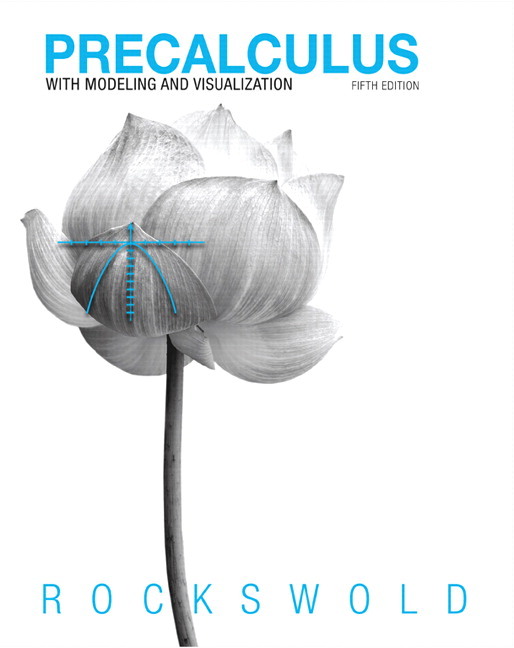 From there, the author shows a connection between application, modeling, and visualization. Rockswold is known for presenting the concept of a function as a unifying theme, with an emphasis on the rule of four (verbal, graphical, numerical, and symbolic representations). The 6th Edition emphasizes conceptual understanding with new in-chapter features and assignment options, while at the same time providing tools to empower instructors to make their classroom more active through collaboration and group work. MyLab™ Math is an online homework, tutorial, and assessment program designed to work with this text to engage students and improve results. Within its structured environment, students practice what they learn, test their understanding, and pursue a personalized study plan that helps them absorb course material and understand difficult concepts. The 6th Edition continues to expand the comprehensive auto-graded exercise options. The pre-existing exercises were carefully reviewed, vetted, and improved using aggregated student usage and performance data over time. In addition, MyLab Math includes new options to support conceptual learning, visualization, and student preparedness. NOTE: This text requires a title-specific MyLab Math access kit. The title-specific access kit provides access to the Rockswold, Precalculus with Modeling & Visualization 6/e accompanying MyLab course ONLY. NEW! MyLab Math Question Types enable students to develop and gauge their conceptual understanding. NEW! See the Concept videos bring key concepts to life and allow students to see the math worked out. Videos are integrated within the eText and available in the multimedia library for easy inclass use. Each video now has an accompanying MyLab Math assessment question, making these truly assignable. NEW! Set Up & Solve exercises require students to show the setup of the solution for a particular exercise as well as the solution, helping them develop an overall problem-solving strategy before attempting the solution. These align with the in-chapter examples that include Getting Started steps. NEW! Putting It All Together questions, based on the end-of-section grids that summarize techniques and concepts, these new questions ask students to classify, sort, categorize, or order mathematical expressions, graphs, and terms. Students enter the course with widely varying skill levels, so MyLab Math includes personalized support and targeted practice to help all students succeed. NEW! Skill Builder offers adaptive practice that is designed to increase students’ ability to complete their assignments. By monitoring student performance on homework, Skill Builder adapts to each student’s needs and provides just-in-time, in-assignment practice to help them improve their proficiency of key learning objectives. NEW! Workspace Assignments allow students to work through an exercise step-by-step, adjusting to the path each student takes and allowing them to show their mathematical reasoning as they progress, receiving feedback when and where they need it most. When accessed via a mobile device, Workspace exercises use handwriting recognition software that allows students to naturally write out their answers with their fingertip or stylus. Getting Ready material provides just-in-time review, integrated throughout the course as needed to prepare students with prerequisite material to succeed. From a quick quiz, a personalized, just-in-time review assignment is generated for each student, allowing them to refresh forgotten concepts. Integrated Review MyLab Math courses provide a full suite of supporting resources for the main course content plus additional assignments and study aids for students who will benefit from remediation. Assignments for the integrated review content are preassigned in MyLab Math, making it easier than ever to create your course! Guided Visualizations enable users to interact with and manipulate figures to bring hard-to-convey math concepts to life. These are assignable in MyLab Math, integrated in the eText, and available to show in-class with accompanying Exploratory Exercises in the Multimedia Library. Enhanced Graphing Utility allows students to graph 3-point quadratic, 4-point cubic, and transformation graphs (which include sine, cosine, logarithmic, and exponential functions). These new graphing questions are assignable in MyLab Math. NEW! Enhanced Sample Assignments make course set-up easier by giving instructors a starting point for each chapter. Each assignment, handpicked by the author, includes a thoughtful mix of question types (e.g., conceptual, skills, etc.) specific to that topic. NEW! Learning Catalytics™ helps instructors generate class discussion, customize lectures, and promote peer-to-peer learning with real-time analytics. As a student response tool, Learning Catalytics uses students’ smartphones, tablets, or laptops to engage them in more interactive tasks and thinking. Upload a full PowerPoint® deck for easy creation of slide questions. Team names are no longer case sensitive. Applications keep the text relevant for students with contemporary examples that draw from a variety of real data and enable students to see the relevance of math, helping them to become more effective problem-solvers. UPDATED! Hundreds of application examples and exercises have been updated to bring timely meaning and relevance to the mathematics. Move students beyond isolated skills by emphasizing conceptual understanding. NEW! See the Concept boxes are a hallmark feature, allowing students to make important connections by walking them through detailed visualizations. Students use graphs, tables, and diagrams to learn new concepts in a concise and efficient way. New to the 6th Edition, See the Concept Videos in MyLab Math bring key concepts to life and are assignable via assessment questions. Making Connections features show how concepts throughout the course are interrelated by pointing out connections between previously learned material and new material. NEW! For examples that require multi-step solutions, the author builds in Getting Started pointers, which help students develop an overall problem-solving strategy before they begin writing a detailed solution. In the 6th Edition, these are assignable in MyLab Math with the new Set Up & Solve exercises. Provide a more active or flipped classroom with new opportunities for collaborative learning and in-class group work. NEW! 8 New Collaborative Activities, developed by the author as Appendix A, follow a project-based learning approach. Students actively explore real-world challenges and apply what they know to produce results that matter. Some activities focus on a specific concept while others span multiple concepts, requiring students to synthesize their knowledge. NEW! The Guided Notebook with Integrated Review Worksheets is ideal for flipped classrooms or any class looking to incorporate more group work and activities. Authored by Laura J. Younts (Santa Fe College) as a one-stop-shop for student engagement, each section contains a structured lecture outline that students fill in during lecture, followed by a group activity to complete in class. It also includes reflection sections to let students record questions they have, space for the work to be done at home, and extended projects for most chapters. Also included are Integrated Review worksheets, which offer additional practice exercise of intermediate algebra topics with ample space for students to show their work. Tailor assignments to instructor course approach and problem-solving support to student learning with a wide variety of assignment options. NEW! By using data to inform this revision--aggregated student usage and performance data in MyLab Math over time--the author was able to adjust exercise difficulty levels, add coverage in the text and in MyLab Math, and ensure a smooth progression from simpler to more challenging exercises. New! Over 600 new exercises were added to the 6th Edition, giving students even more abundant opportunities for practice and review. Each set of exercises covers skill building, mathematical concepts, and applications. Graphical interpretation and tables of data are often used to extend students’ understanding of mathematical concepts. Additional exercise sets include Word problems, Checking Basic Concepts, Chapter Review Exercises, Extended and Discovery Exercises, and Writing About Mathematics. NEW! Additional exercise types lend more flexibility for instructors, including Critical Thinking exercises and Interpret & Analyze in Context exercises that ask students to interpret math used in real life. Checking Symbolic Skills exercises provide a preview into important topics that students will see again in calculus. Cumulative Reviews, which appear every few chapters, require students to understand and use multiple skills from different chapters. This is an excellent test of comprehension of key concepts. Robust, built-in study aids ensure that each chapter is designed as a study tool. “Now Try” exercise suggestions follow every example, allowing students to immediately reinforce the concepts as they are reading. Comment Boxes allow graphs, tables, and symbolic explanations to be labeled in such a way that a concept is easier to understand. The explanation is now tied closely to a graph, table, or equation. Chapter Summary Grids allow students to review quickly with an easy-to-read grid format, listing the Concept and providing an Explanation and Example. Comprehensive end-of-chapter material serves as an excellent resource for extra practice and test preparation. Each chapter concludes with a summary of key concepts, Review Exercises, and Extended and Discovery Exercises. Teach at students’ varying skill levels with author and MyLab Math offerings. NEW! Integrated Review options offer additional practice for relevant intermediate algebra topics, to ensure that more students are successful in their Precalculus course. In addition to the Guided Notebook with Integrated Review Worksheets mentioned above, MyLab Math offers an Integrated Review course for this title, which leverages personalized learning to bring underprepared students up to speed for college algebra. Chapter R, Reference contains review material from intermediate algebra and basic geometry courses. This material is referenced by Algebra Review and Geometry Review margin notes. The feature frees instructors from having to frequently review materials from prior courses and connects to optional “Getting Ready” assignments in MyLab Math. MyLab™ Math is an online homework, tutorial, and assessment program designed to work with this text to engage students and improve results. Within its structured environment, students practice what they learn, test their understanding, and pursue a personalized study plan that helps them absorb course material and understand difficult concepts. For the 6th Edition, “See the Concept,” “Getting Ready,” and “Putting It All Together” questions are now rendered and can be assigned in MyLab Math. Video assessment questions help students have a more meaningful experience with the concepts presented, and interactive figures allow students to visualize difficult topics. See the Concept videos bring key concepts in the text to life and allow students to benefit from seeing the math worked out. Videos are also integrated throughout the eText for immediate access when students need it most and are available in the Multimedia Library for easy inclass use. Each See the Concept video now has an accompanying MyLab Math assessment question, making these videos truly assignable . Putting It All Together at the end of every section summarizes techniques and reinforces the mathematical concepts presented in the section in an easy-to-follow grid. For the 6th Edition, Putting It All Together questions are assignable in MyLab Math as conceptual questions, asking students to classify, sort, categorize, or order mathematical expressions, graphs, and terms. See the Concept boxes are a hallmark feature, allowing students to make important connections by walking them through detailed visualizations. Students use graphs, tables, and diagrams to learn new concepts in a concise and efficient way. New to the 6th Edition, See the Concept Videos in MyLab Math bring key concepts to life and are assignable via assessment questions. New Exercise Types emphasize conceptual understanding and connections to calculus. Critical Thinking exercises ask students to take a mathematical concept a step further than what is discussed in the text. They challenge students to think beyond the pages of the book. Interpret & Analyze in Context exercises indicate where students need to interpret or analyze math used to describe real life. Checking Symbolic Skills exercises provide a preview into important topics that students will see again in calculus. 8 New Collaborative Activities, developed by the author as Appendix A, follow a project-based learning approach. Students actively explore real-world challenges and apply what they know to produce results that matter. Some activities focus on a specific concept while others span multiple concepts, requiring students to synthesize their knowledge. The Guided Notebook with Integrated Review Worksheets, available in MyLab Math or as a print supplement, is ideal for flipped classrooms or any class looking to incorporate more group work and activities. Authored by Laura J. Younts (Santa Fe College) as a one-stop-shop for student engagement, each section contains a structured lecture outline that students fill in during lecture, followed by a group activity to complete in class. It also includes reflection sections to let students record questions they have, space for the work to be done at home, and extended projects for most chapters. The Integrated Review Worksheets offer additional practice exercises of relevant intermediate algebra topics with ample space for students to show their work. These are included in the Guided Notebook as well as within the MyLab Math Integrated Review course option, which is designed to bring underprepared students up to speed. Data-Driven Revision: The author analyzed the aggregated student usage and performance data in MyLab Math over time. This data was used to adjust exercise difficulty levels, to add coverage in the text and in MyLab Math, and ensure a smooth progression from simpler to more challenging exercises. Hundreds of application examples and exercises have been updated to bring timely meaning and relevance to the mathematics. Over 600 new exercises have been added throughout the text, both at the basic and higher levels of difficulty. More critical thinking about graphical interpretation has been added. These examples and exercises often ask students to identify characteristics of a graph, such as intercepts, zeros, extrema, and intervals where the graph is increasing or decreasing. The definition of intercept has been changed to be a point, rather than a real number, at the request of reviewers. More emphasis on domain and range in context has been included. Chapter 1 includes the new topics of finding percent change and the center of a circle by completing the square. Interval notation is now introduced in Chapter 1. More discussion of graphing linear functions by hand, interpreting domain and range in context, applying the Pythagorean theorem, and determining an appropriate calculator window have been added. Chapter 2 has additional examples and exercises covering piecewisedefined functions, absolute value inequalities, and critical thinking about graphs of functions. A new subsection on percentages has been included and a more complete discussion of the x—intercept method has also been added. Chapter 3 now has a graphical derivation of the vertex formula that is student accessible. There is additional emphasis on domain and range in context and also identifying the domain and range of translated and reflected functions. Chapter 4 has a new subsection covering graphs of power functions having integer exponents. Much of Section 4.2 has been rewritten to make it more accessible for students. Chapter 5 has a new subsection covering exponential and logarithmic inequalities. More discussion of linear and exponential growth, simplifying functions and their domains, and logarithmic and exponential forms has been added. More modeling examples and exercises that require students to select a modeling function have been added to Section 5.7. Chapter 6 has new coverage of supply and demand applications along with finding equilibrium prices and quantities. Additional business and social network applications have also been added. A new discussion of steps for solving a system of equations using the elimination method has been included. Chapter 7 has new examples and exercises for finding the standard equation of a circle by completing the square. Chapter 8 has new See the Concept boxes that help explain the distinction between arithmetic and geometric sequences. Appendix A is new and contains several Collaborative Activities that can be completed in or out of class. These activities, or projects, are applicationbased and include discussion of results and often require connections with previous concepts. Gary Rockswold has taught mathematics, computer science, and physical science at a wide variety of levels, including high school, undergraduate, and graduate students for over 30 years. He received his bachelor’s degree from St. Olaf College and his Ph.D. in applied mathematics from Iowa State University. He has been a principal investigator of parallel computing at the Minnesota Supercomputer Institute and is an emeritus professor of mathematics at Minnesota State University, Mankato. He is an author and has published numerous mathematics textbooks for Pearson Education at both the developmental and collegiate levels. His motivation for writing is to make mathematics more inclusive for a greater number of students by presenting mathematics in a contextual, meaningful way.